I know, I know, corny title, but I just couldn't resist. I woke up one morning last week and I just needed to bake bread. I was literally obsessed with it. Am I the only one this happens to? Anyways, I started looking for a recipe that wouldn't be complicated but still good and to which I had all the ingredients. I found this Buttermilk Honey Bread on Rosa's Yummy Yums, via Food Blog Search (I just love that site) and it was perfect! There is just something so satisfying about bread baking. You start with next to nothing and end up with a fragrant little miracle! The first time around, I made three small braided loaves; one went to a friend and the other two loaves didn't last very long, we devoured them! Visit Rosa for the recipe (she has it in English and in French!) and have a great weekend! EDIT: I just noticed when I was uploading my pics to Flickr that in the post, the photos look dull compared to what they look like in Flickr. Does this happen to anyone else? Is there a way to remedy this? Thanks for your input! Gorgeous bread!!! I envy you. I am terrible at making anything with yeast. That's one very good looking bread! ciao!! bellissimo questo pane! anch'io adoro impastare!! ciao! Grr... I'm always so jealous when you guys turn out magnificent looking bread and mine are always dense and rough! It's beautiful! By the way, I can't think of a reason why it would be duller in the post, but maybe when flickr resizes, there is a drop in quality? No, you're not the only this happens to. Except with me, it's usually quick breads or cookies. I *knead* to get the bread bug now too. Beautiful bread! Can't think of a better thing to do on a cold day than bake and eat bread, with a little butter. Yum! That is beautiful. 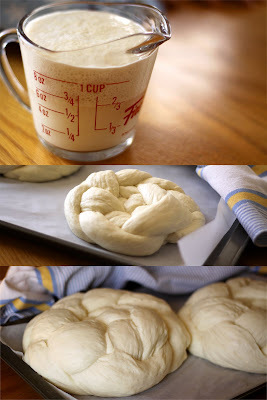 I have been making bagels and English muffins lately, but maybe I need to give this a try. I do have some buttermilk in the fridge. Hum. Oh I wish I had a slice of this to go with my soup! Looks absolutely delish! 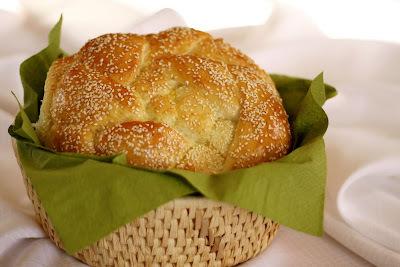 That is a great looking bread, I have to say - and I'm salivating over it now. Now I knead to bake as well, dearie! 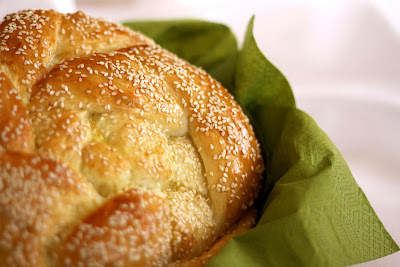 Lyb, your braided bread with sesame seeds reminds me of my mom's bread...just awesome! Thanks for dropping by my site..us Canucks connect! I made this last night, and it was absolutely lovely, especially warm out of the oven! Thanks for all the great recipe recommendations -- I keep coming back for more!